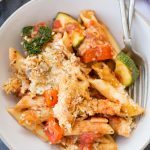 This Easy Vegetable Pasta bake is loaded with Vegetables, has a Chessy Sauce and takes less than 30 minutes to make. A perfect weeknight meal or to serve a crowd. Well, what’s not to love about this Cheesy Pasta Bake? Perfectly cooked pasta, fresh Vegetables, delicious tomato Sauce and of course lots of cheese. To top all these deliciousness there is crunchy topping made with bread crumbs, parmesan cheese. This Pasta Bake is going to every pasta lovers favourite dish. Do you find it hard to feed veggies to your kids? At least I do. Why kids, even my husband is not a big fan of Vegetables. I always find ways to sneak in those veggies to a dish in a different form. 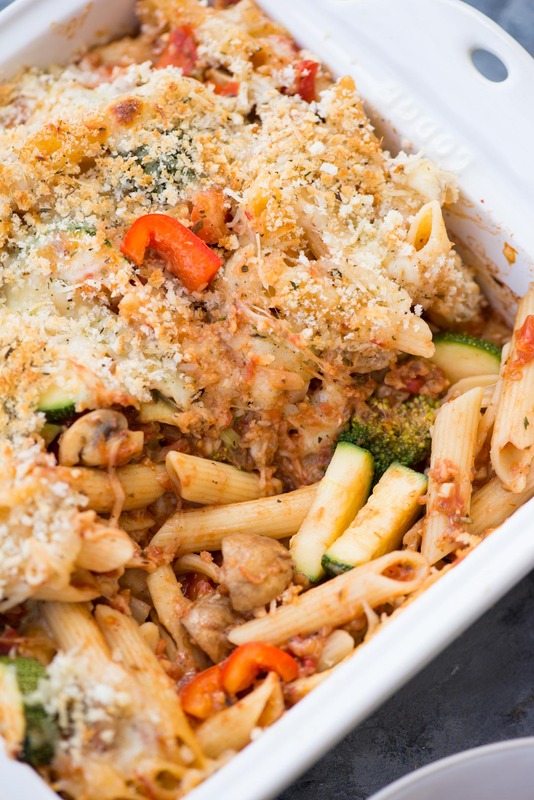 This Vegetable Pasta bake is also very versatile. 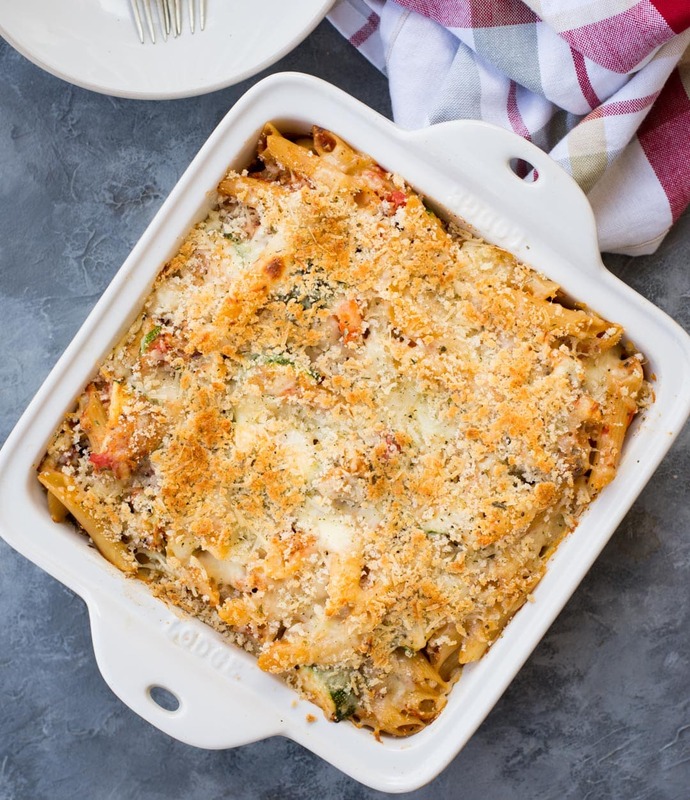 You can use any kind of veggies in this cheesy pasta bake. 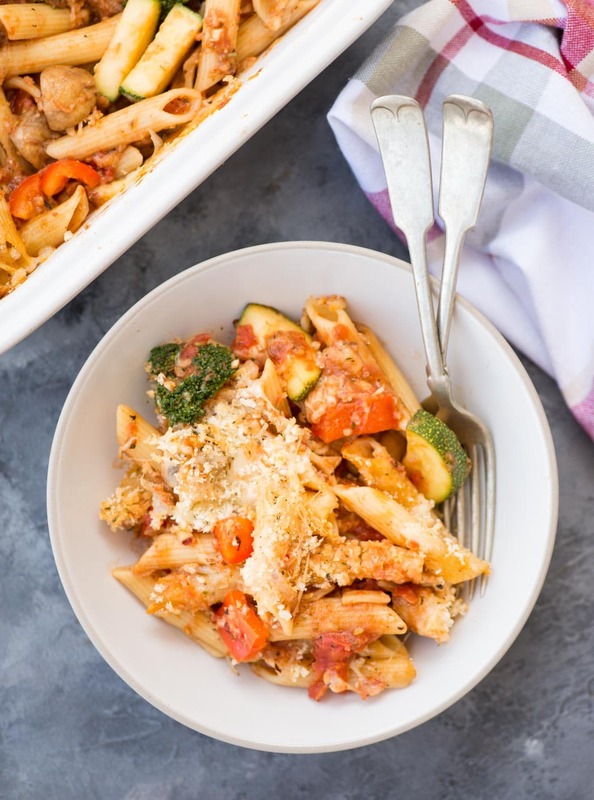 Most of the time I make this pasta bake to use those tiny portions of vegetables lying in the fridge. Cook pasta just until al dente. Because the pasta will be baked further along with the sauce. So be careful not to overcook the pasta. Coming to vegetables you can use peppers, corn, peas, Zucchini, Spinach etc. If you are using a vegetable that tends to lose water when cooked like Mushroom, then I prefer cooking them before adding to the pasta. Good quality ripe and Juicy Tomatoes gives a lot of colour and flavour. You can either use canned or homemade crushed tomatoes. If using readymade Pasta sauce, then adjust the quantity of seasoning like herbs, chilli flakes in the recipe. The breadcrumb and parmesan topping is optional. But I personally prefer the crunch it gives in every bite. Though the pasta bake has enough sauce and cheese, sometimes I prefer adding 1/2 cup of bechamel sauce to make it more creamy. You can easily refrigerate the leftovers up to 3-4 days. Keep the leftovers in a food grade container, cover and refrigerate up to 3-4 days. Start with boiling water in a big pot. Salt it and add pasta. Cook pasta just until it is al dente. Rinse with cold water and keep aside. In the same pan used above or in another pan heat oil. Add Chopped Onion. Saute till it softens. Add minced garlic, cook it for 30 seconds. Add Sliced mushroom. Cook until the mushroom has softened and most of the liquid has evaporated. Add sliced Zucchini, peppers. Mix everything well and cook for a minute. In a big mixing bowl add Pasta, vegetable mixture, tomato sauce, blanched broccoli, Seasoning, Chilli flakes, sugar, half of the Mozerella cheese. Mix everything well. In another bowl add all the ingredients mentioned under breadcrumb toppings. In an 8X8 inch baking pan, Pour half of the mixture. Sprinkle some Mozerella Cheese. Spread rest of the Pasta mixture. Sprinkle rest of the mozzarella cheese. Sprinkle breadcrumb mixture on top. Cover tightly in an aluminium foil. Bake for 20 minutes. Then uncover and bake for 10 minutes more. Serve along with crusty garlic bread.